We like to recognize outstanding shooting accomplishments — this example by one of our Forum members from across the border in Canada. 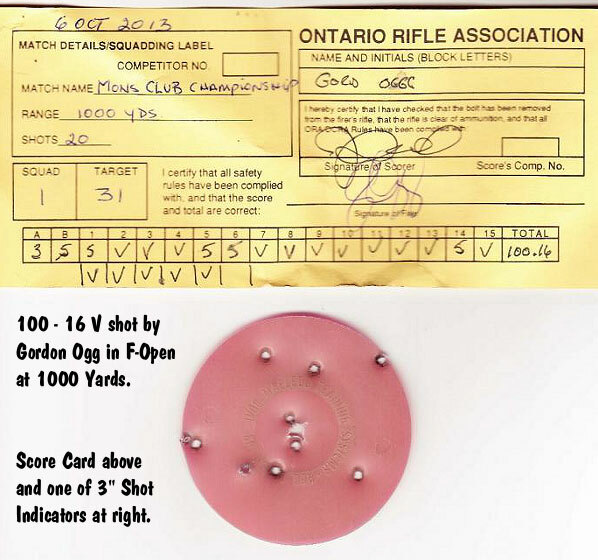 In a regional F-Class match, Gordon Ogg (aka ‘Ont001′) shot a 100-16V, which is believed the highest score shot in a match of this type in Canada. Gord hit all Fives for a perfect 100-point, 20-shot string of fire, with 16 in the V-Ring, the equivalent of the X-Ring in the USA. (A FIVE in Canadian scoring is the equivalent of a TEN in USA scoring.) Here is a photo of the official score card and one of the 3″-diameter Shot Indicators. I was shooting 7mm WSM ammo I had left-over from the U.S. Nationals and F-Class World Championships. The rifle proved it still had life left in it — it continued to make me look good. My first relay went well, with a 99-15V. On the second match, it was working very well and I had not realized ’til after the last shot and Jim, my scorekeeper, gave me the total, did I actually think it could actually be a record. All I can say is… it felt GOOD. Due to predicted thunderstorms for the afternoon, the match director changed the course of fire from [three matches], to two [20-shot] matches. First match was unlimited sighters and 20 on score and the second was 2 and 20 in string fire. As the weather did continue to deteriorate, it was a wise decision, as we would not have made it through all three matches. Is This a New Canadian Record? Though Gord’s fellow shooters believe this was a “best-ever” F-Open performance in Canada, it does not appear to be one for the record-books. Gord tells us: “As the Mons Range Championship was a DCRA/ORA sanctioned match in Canada, and our National body does not have a ‘records’ section to compare for a Canadian F-Open record, at best it can be considered a Mons Championship Match record of sorts.” Still, Gord’s 100-16V (the equivalent of a 200-16X under USA scoring) is an impressive feat. The current United States NRA F-Open Record for 20 shots at 1000 yards is 200-15X which is shared by a number of people but first set by Danny Biggs. Share the post "Canadian Shoots Best-Ever 100-16V in 1000-Yard F-Open Match"